Maybe it’s recency bias but did Nebraska’s offense have much flair last season? We’re talking on-field flash, not just in general. Stanley Morgan Jr. is one of the smoothest cats you’ll find, but on the field he’s business, blocking, running you over, winning, those kinds of things. 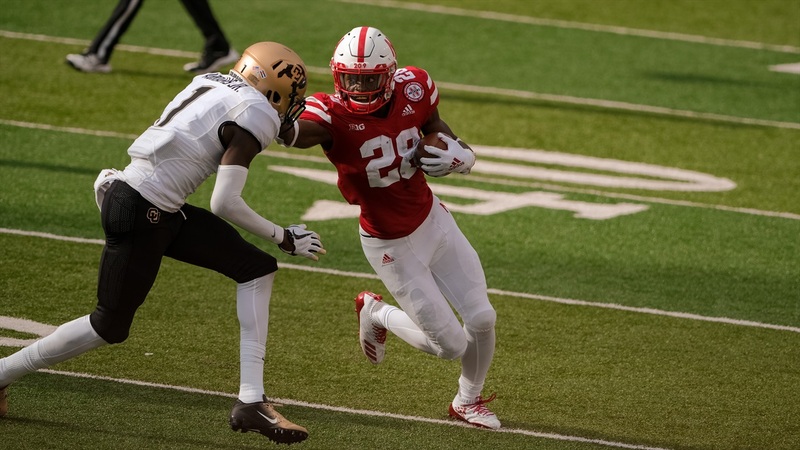 The flashiest thing JD Spielman did last season was point to the sky when he took his first collegiate touch 99 yards for a touchdown. And there’s nothing really wrong with that. Both those guys had historic seasons. Morgan owns the program’s single-season yardage record. Practically the entire receiving section of the freshman record book has Spielman’s name on it. You can win football without flash. Nick Saban says hello. But watching Nebraska’s offense go to work against Colorado on Saturday put this thought in my head; watching everything back again a few more times since has only served to reaffirm it. The sauce is back in Nebraska’s offense. I take you to the 6:47 mark of the first quarter. Nebraska is trailing 14-0 and taking over possession at the 25-yard-line. Maurice Washington then does this. Bob Wischusen on the call says Washington gets “walloped.” The kid took a lick on his first play. He just hopped right back up and immediately got in senior linebacker Rick Gamboa’s face. Mind you, Nebraska is losing at this point and this is the first time Washington has touched the ball. That’s fire. It’s straight sauce. Washington has it in spades. He dances all over the field when there’s music blasting. It’s a confidence thing. Almost like what I wrote about the Blackshirts playing like the Blackshirts, Washington knows he’s good, he thinks he’s better than you and he’s going to prove it. I take you to the five-minute mark in the first quarter. Nebraska is still trailing 14-0 and has just been hit in the backfield to bring up a third-and-17. Mike Williams then does this. Not only did he pick up the first down on third-and-forever, not only did he stand over the dude he just gave a piggyback to, but Williams then had some words for sophomore defensive back Ronni Blackmon as he walked away from the play. I don’t want to put words in his mouth but as he’s staring Blackmon down and nodding his head, it sure had one of those “Yeah, we’re here,” feels to it. Williams, the junior college transfer from East Mississippi Community College, has been called the team’s toughest guy pound-for-pound. He also gets super competitive when people question his status as the fastest guy on the team. He’s mostly reserved in interview settings and doesn’t for one second give off a cocky vibe. The sauce, though. It’s there. I take you to the four-minute mark in the first quarter. Nebraska is still trailing 14-0 (though not for long). Adrian Martinez then does this. The juke… Oh my, that juke. Junior defensive back Delrick Abrams Jr. still has yet to pick himself up off the field; he’s still looking for the ankles Martinez snatched. But let’s talk about the dive for a second. Maybe the Husker coaching staff isn’t thrilled Martinez took that dive in the first place but oh boy if it wasn’t smooth. And he landed fully on a surgically repaired right shoulder that cost him all that missed time in the first place. Martinez is as mature and composed as maybe any true freshman in college football, but the kid has some style. And then there’s the ball flip at the very end of it. What a baller. Martinez very much looked the part Saturday. He completed 75 percent of his passes, threw for 187 yards, ran for another 117 and scored three times. Nebraska wants the two turnovers to go away but the coaching staff was more than pleased with his performance. He backed up everything. The freshman has this playmaker gene that was lacking from the position last season. It’s that edge-of-your-seat sensation that wasn’t there in 2017. Every time he started to hop around in the pocket, this thought of, ‘Okay, something special might happen,’ danced around in people’s brains. When he side-armed a bullet to tight end Jack Stoll after stiff-arming freshman d-lineman Israel Antwine into the turf you just know there were some out there in Husker Nation questioning naming their first-born Adrian. I take you to the one-minute mark in the third quarter. Nebraska’s in the early stages of that 28-27 back-and-forth that saw both teams try to give the other the game. Chris Berman has come out of retirement for one more “WOOP!” This is Game 1 of Washington’s college career and he’s pulling a Barry Sanders move on unsuspecting Colorado defenders. The disrespect. The absolute disrespect. All throughout the game, Washington was lowering shoulders into people and seeking out contact. Coming from a kid who wasn’t playing football, wasn’t working out and wasn’t eating right before August, that’s beyond impressive. There’s no fear in him. I take you to the 20-second mark in the third quarter. It’s still 28-27 and the Huskers have the keys out. (They’re driving.) Washington has already given Nebraska some yardage on the drive, but Nebraska needs points. I’m sorry. What? Was that… was that a fake slide? Did he just pull a hesi-slide on the fly? Did he really just do that? If he slid, he would have been down at the 41-yard-line. If. Instead, he decides to cover the ball and keep rumbling towards the sideline, a decision that earns him another 10 yards. Now, it’s entirely possible Martinez thought to slide, saw Washington running towards him and a Colorado defender about to fall in front of him and instincts kicked in. Get past that potential trip-up, then go down. But that’s not fun and it’s also not as much of a given considering what we’ve already seen from the Diaper Dandy. Martinez didn’t slide at all on Saturday. He’ll need to learn if he’s going to continue to take shots in the running game, but that’s future Martinez’s problem. In the meantime, just keep doing that fake slide thing, please. A couple things. This is not an open endorsement for guys to run their mouths on a football field or act like the quarterback from the latest season of “Last Chance U.” There’s a fine line between confident and cocky. You need to be a little cocky, for sure (the guy who won last year’s Heisman Trophy proved that, and his offense fed off that energy), but finding the balance is important. And Nebraska shouldn’t really have an issue keeping that balance. Linebacker Caleb Tannor, another highly-touted true freshman, said the coaching staff has done well to keep him grounded. They’re doing the same with everyone else. But a little bit of showmanship is never a bad thing. A little bit of flash? It keeps things interesting. Maybe this is a result of coach Scott Frost and his "No Fear of Failure" mantra. Maybe this is a group of players being emboldened to be themselves while simultaneously being injected with some confidence that, if executed properly, they're running an offense that can't be stopped. Either way, sauce is good. Nebraska’s offense has it again. This is going to be fun.